True Calendar (T.C.) 71—a new age where 70% of the human population lives in space thanks to the development of "Dyson Sphere", a city in space. The world is divided into two main powers: The Dorssia Military Pact Federation, a power which grew out of a military alliance, and the Atlantic Rim United States (ARUS), which grew in power as it expanded its trade agreements. The minor nation of JIOR has declared neutrality between these two forces and maintains its peace through economic prosperity. Within the JIOR's Sphere, Haruto Tokishima lived an ordinary life as a high school student in the division known as "Module 77"—until the Dorssian military begins their sudden invasion! But the whole world will be shaken when Haruto meets the mysterious humanoid weapon, Valvrave! 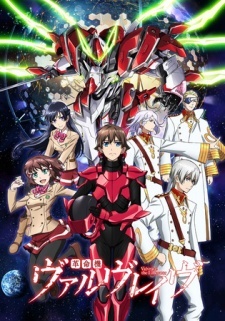 Watch Kakumeiki Valvrave Episodes Online at Animegg.org. Kakumeiki Valvrave is available in High Definition only through Animegg.org. Choose an episode below and start watching Kakumeiki Valvrave in Subbed & Dubbed HD now.